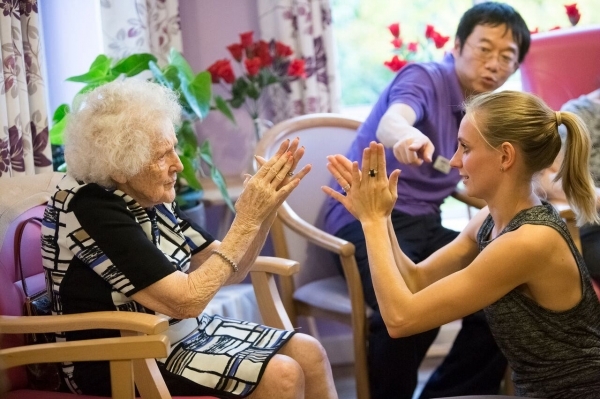 The project is a unique opportunity for dancers from the New Adventures company to obtain new skills in delivering creative dance sessions specifically for people living with dementia. Since 2008 New Adventures has developed a team of passionate and dedicated dance-artists who now act as leading ambassadors for the company in a community setting. In recent years the Company has become interested in working with older people to explore their relationship with dance. There have also been many academic studies as to the impact that music can have on people living with dementia and New Adventures were interested in testing the impact of creative dance on improving the lives of people living with dementia. In 2015 a pilot project was launched in partnership with Dementia Pathfinders in which our team of practitioners went into two separate care homes and delivered dance workshops over the course of 6 weeks to residents living with various stages of dementia. The experience was moving and the results incredibly encouraging. In October 2016 we ran the programme again in Hampton Care in the South East and look forward to taking the learning and development further in 2017. An independent consultant evaluated the Dance for Life pilot project. The report was launched, alongside a mini-documentary at a special event on Friday 20 January 2017. As an extension of our Dance for Life project, DanceEast launched a new programme of weekly classes in January 2017, for family carers and people living with dementia, in partnership with us and Dementia Pathfinders. The sessions are designed for family carers and those in the early stages of dementia to share the experience together.